Rihanna has no problem blowing up on fans who tweet recklessly at her so it's not surprising that she got caught in another war of words. This time the battle was between her and a fan who misundertood a tweet she put out. Check out the exchange of tweets below where tons of B- words and insults were exchanged. Read from the bottom up. 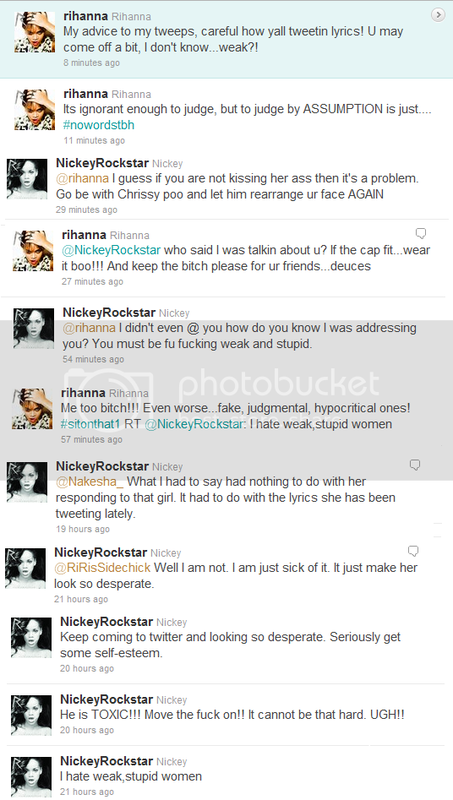 One thing we can say about Rih is that she is a no nonsense type of gal that is not afraid to put anyone, even a fan, in their place. But, this whole exchange seems like there may be some huge misunderstandings and defensiveness involved on both sides. They should just e-hug it out and let bygones be bygones.